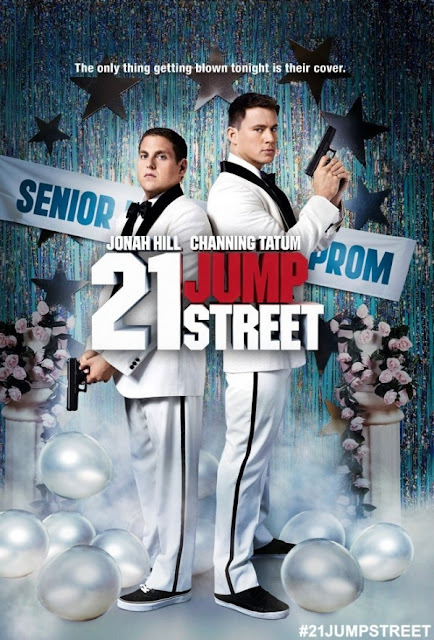 Morton Schmidt (Jonah Hill) and Greg Janko (Channing Tatum) occupy different rungs of the social ladder at their High School. Greg is a popular jock, and Morton is unpopular nerd. Years after graduation, their paths cross again at the local police academy. Morton has the brains, and Greg has the brawn. Finding that they complement each other nicely, a bond grows between the two. Unfortunately their performance leaves a lot to be desired. In hopes of salvaging their careers, a superior decides to assign them to 21 Jump Street, where they will serve under the belligerent Captain Dickson (Ice Cube). They are then required go deep cover as high school students to infiltrate a drug ring operating out of their old alma mater. To their chagrin, high school turns out to be even more of a challenge the second time around. 21 Jump Street is an adaptation of the popular 80’s television cop drama. The show took itself quite seriously. The film is a raunchy comedy in the most modern sense imaginable. It’s also a deconstruction of police thrillers in which a character goes deep cover to infiltrate a criminal organization. While such a description might make 21 Jump Street sound consistent with what the trailers have shown, in reality it actually offers a bit more than that. As with so many comedies these days, 21 Jump Street is wall to wall with self-aware humor. While the heroes are being dressed down by deputy Chief Hardy, the chief offers a description of the 21 Jump street program that isn’t altogether different from the popular perception of Hollywood: As a creatively bankrupt institution content with recycling old ideas. 21 Jump Street itself is an example of that process. That’s about as blatant as the film gets with such things, but it may fly over the head of more inattentive viewers. That’s the hidden strength of 21 Jump Street. Unlike the similarly themed Hot Fuzz (Or just about any other collaboration between Simon Pegg and Edgar Wright for that matter), 21 Jump Street does not waste it’s time trying to show how clever it is. Hot Fuzz gave viewers a good sense of what it was trying to be, all the while coasting (to a considerable degree) on audience good will toward those involved. The action set pieces parodied Michael Bay with the use of quick cuts and tight shots. However, it was clear that the production didn’t have the budget to go truly big scale, which felt like a bit of a cheat. 21 Jump Street, on the other hand, has a reach equal to its grasp. It parodies a genre while at the same time being a competent example of it. Michael Bacall’s script is smarter than it appears on the surface. He has essentially constructed a story that works on many levels simultaneously. He couples the nerd wish fulfillment aspects of modern superhero films such as Spider-Man and couples them with the “reliving high school” motif. Along the way, he also manages to parody the tropes of undercover cop dramas. Somewhere in all of this, he manages to make some interesting (if obvious) observations about modern culture. For instance, many aspects of so called “Geek” culture are now considered cool. At times, 21 Jump Street suffers from the same sense of one upsmanship that ruined The Hangover 2. The film gleefully pushes the envelope in terms of vulgarity, and sometimes it feels forced. The humor works best when it isn’t trying so hard. The single funniest stretch in the entire film is a drug trip shown from the perspective of heroes. It’s silly as Hell, and goes on just long enough not to wear out its welcome. 21 Jump Street is ten times better than its trailers would have anyone believe. It’s both unpretentious and much more than the sum of its parts. This film really benefits from having a solid script and cast made up of actors unafraid to send up their own screen personas. In an era where gross out comedies often forget to add enough actual comedy to the mix, 21 Jump Street gets the balance right. Raunchy and profane by design, nothing like the 80s TV show, nonetheless hilarious adult comedy - especially the first hour or so.